The purpose of this policy is to establish the terms and conditions under which Library space may be used for filming, still photography and/or video production related to coursework. This policy applies to filming, photography and video production by current Ryerson students, with the exception of film crews/photographers employed by the University for public relations purposes. 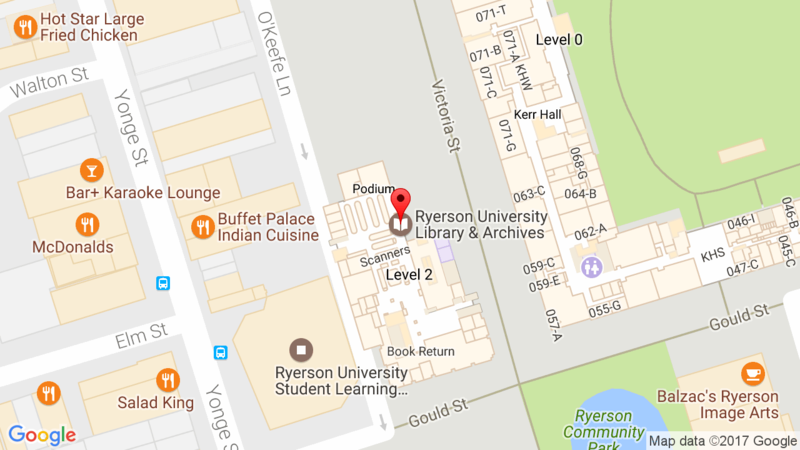 The Library is a place where Ryerson students, faculty, staff and members of the public study, conduct research, and use information resources and services. As such, the first claim for use of space is to those persons engaged in quiet study, research and use of information resources and services. The Library’s Code of Conduct is designed to set the framework for providing a minimal noise environment. Please note that filming is available on floors 5-9 only – this includes group study rooms located on these floors that have been booked by a member of the film crew. Film crews should be respectful of users who come to the Library to study quietly – elaborate set ups and excessive discussion and conversation that disturbs library users is not permitted. Also, NO filming is permitted for the period from one week before the start of an exam period until the end of the exam period. Students wishing to direct a film shoot should read, complete and sign the Student Film Shoot Request Form. Note that the course instructor is also required to sign off on the request form. This form should normally be completed at least 48 hours in advance of the filming. Other circumstances will be approved on an ad hoc basis. Any staff person on duty at the Research Help Desk has the authority to approve a film shoot, upon satisfactory completion of the form. The staff person on duty may consult the Communications and Liaison Librarian or the Chief Librarian if there are conditions which require further clarification and/or approval. Security will be advised of any approved film shoots.